Chilly weeknight in April? Didn’t matter. Shea was jumping. The whole day was exciting for me as a baseball fan–but as a baseball collector who was about to be filmed for SportsNet NY (SNY), it made me jittery. But at least it was sunny. Normally, the weather gods poop on me whenever I have a big interview. 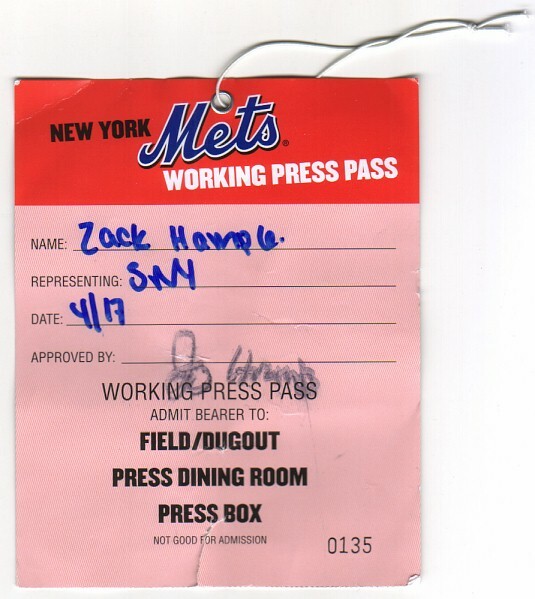 June 11, 1996…the day a reporter came to Shea to watch me catch my 1,000th ball? BP was rained out. June 29, 1999…the day CNN took me to Veterans Stadium in Philadelphia? BP was rained out. 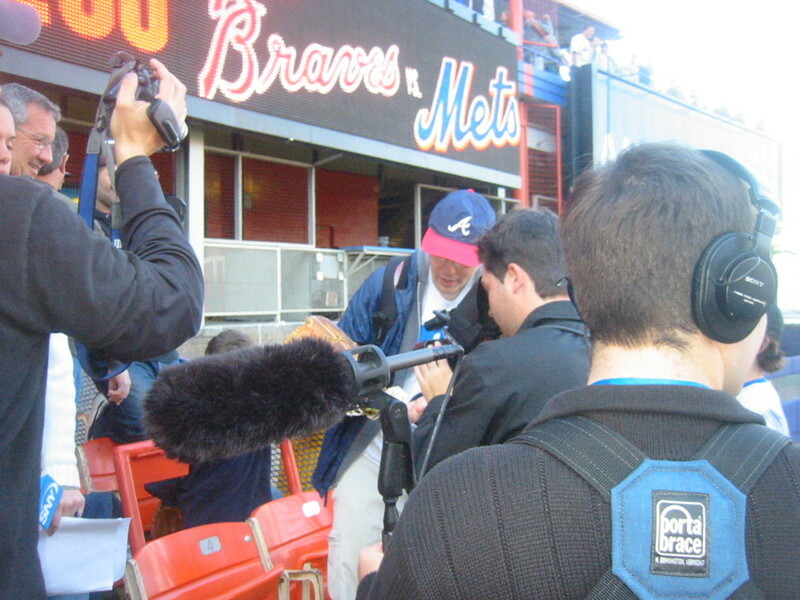 August 24, 2004…the day FoxSports sent a film crew to Shea to catch me in action? Yeah. I looked up. A man with one of those fancy laminated media badges was walking toward me. I shook his hand. It wasn’t Andrew. It was Tony. Andrew was the SNY producer who’d be doing my segment. He’d sent this guy to look for me. Not counting the time when a fan who was holding my legs dropped me, I’d only been on the field a couple times before–once for Banner Day back in 1993 and again the next year for a tryout–so it was pretty exciting to get to walk through the tunnel and out below the seats and onto the warning track directly behind home plate. The Mets pitchers were taking early BP, and several position players were throwing in front of the dugout. Julio Franco walked right past us. Tony introduced me to Andrew and the rest of the film crew, and we all hung out there and talked about what I’d be doing and how they’d get it on film. Andrew told me that this wasn’t going to be a straight-up interview, but rather a first-person account of what I was doing and why I was doing it. In other words, I was going to have to keep talking to the camera and explain all my strategies/neuroses as the day progressed. The crew had hooked me up with a microphone. They put the transmitter in my pocket and ran the wire up the inside of my shirt and clipped the mic where it wouldn’t be seen. Unfortunately, it ended up slipping out of place a few times, so in addition to the main camera, Andrew used a palmcorder for backup. I headed out to the right field seats, and the four-person crew followed me. Ushers were stepping aside, and fans were staring. It felt incredible to be the center of attention. I mean, what can I say? It really did. I don’t consider myself famous. I suppose I’m well known…but only in the baseball world, and even within this world, I try to lay low at games and blend in. But yesterday, there was no blending. I had the opportunity to play the role of celebrity, and I went with it. Within a couple minutes, I got Mets pitcher Jorge Julio to toss me a ball. Phew! I was in shallow right field, along the foul line, and Julio was way out on the warning track in front of the Mets bullpen. The seats were mostly empty. I shouted. He looked up. I waved. We made eye contact. He lobbed the ball from about 100 feet away. It was all pretty standard stuff, but it felt great. I held up the ball for the camera and showed how I numbered it, and I explained that I keep a ball log on my computer and that I’d type up all the details when I got home. Andrew did ask me a few questions here and there, just to prompt me. I assume those questions will be edited out…but anyway, he wanted me to give an intro to the camera, so I said something like, “Hi, I’m Zack, and I collect baseballs at major league games. We’re here at Shea Stadium on April 17th. Pedro’s going for his 200th win, and I’m going for as many baseballs as possible.” He had me say some other stuff including, “Hi, I’m Zack, the baseball collector, and you’re watching Mets Weekly.” I nailed most of the lines on the first shot, but a few times, I muffed a certain word or went on too long, so he had me try it again. Fun, fun, fun. Some other fans had found their way out to my section, so I told the camera that it was time to head up to my corner spot in the Loge Level. I did well in that spot at my last game, getting balls from Tom Glavine, Victor Diaz, Chris Woodward, Endy Chavez, and bullpen catcher Dave Racaniello. Yesterday, I was afraid that all those guys would remember me, but luckily, there was a whole different batch of players out in right field. With the cameras rolling, I got balls thrown to me by Brian Bannister, Victor Zambrano, Billy Wagner, and Duaner Sanchez. NICE! I had five balls, and it was only 5:10pm. Somehow–actually I don’t know how because it was seriously crowded–I was able to squirm into the front row behind the dugout. When the Mets came off the field after BP, I got a ball from coach Manny Acta. That guy is my hero. He tossed me two balls in 2003, two more in 2004, four in 2005, and two already this year in only two games. That’s TEN balls, and there might be more. I didn’t start my ball log until ’03. I switched from my Mets cap to my Braves cap, got heckled for it–on camera–by two fans, and headed to the 3rd base side. That’s when I ran into my friend Sean…the guy who went to Camden Yards with me on September 6, 2005. Sean knew what was up. I handed him my crappy little digital camera, and he went nuts with it. Two little kids, decked out in Mets gear and face paint, started asking me all about the trick. I told them some strategies (“DON’T wear Mets gear…”), and they kept asking questions, and the cameras kept rolling. That happened a few times with other kids over the course of the day. The cameras followed me to the Braves dugout at the end of BP. Nothing. I was still stuck on seven, which I realize is not terrible, but it was frustrating. I’d gotten five balls in 30 minutes, then two balls in 60 minutes. If ever there was going to be a record-breaking day, why couldn’t THIS be it? Sean left for his seat in the Mezzanine. The crew took a little break. I scarfed my ham-and-cheese wrap and tried unsuccessfully to get a ball right before the game at the Braves dugout. Then I met up with the crew in the concourse behind home plate, and we all headed up to the Loge. The Loge is the BEST spot for foul balls, but there weren’t any empty seats, and security had been cracking down on me for standing in the runways. There was some other foul tip on the 3rd base side an inning later. Not as exciting. Pete Orr hit it. The ball shot back straight at me, fell a few rows short, got bobbled, bounced straight up in the air in my direction, and some tall guy in the row right in front of me reached up and snatched it. What the [expletive deleted]. Even though I came close twice in two innings, Andrew decided to stop filming. That was a real bummer. He was a bit nervous to leave me with that press pass–I could’ve used it to get into the press box or even the clubhouse–but I assured him I’d behave. And I did. The supervisors, meanwhile, granted me “diplomatic immunity” for the rest of the night. “Go do your thing,” they said. They even told the ushers to let me stand in the runways. Way cool. But no more balls, and that was almost okay. 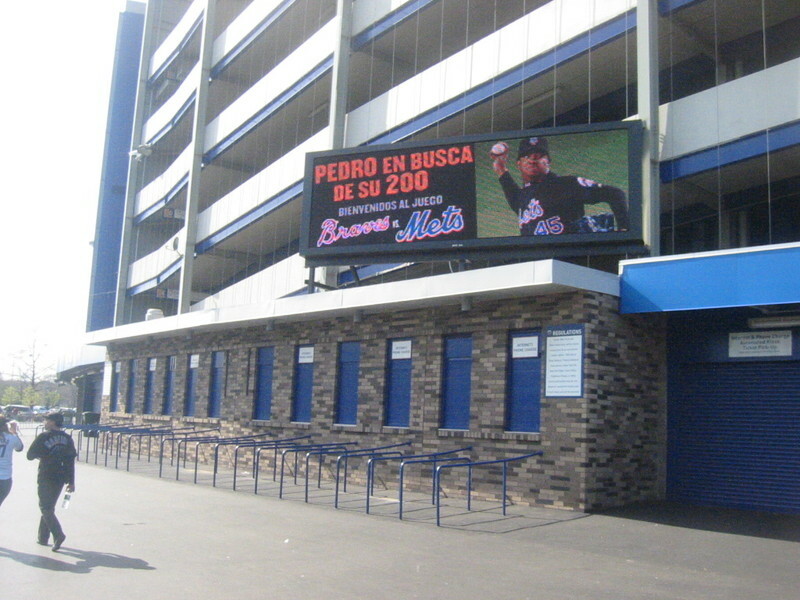 The cameras were gone, so I felt like it didn’t matter, and anyway, Pedro was going for No. 200. He left after 6 2/3 innings with eight strikeouts and a 4-3 lead. Duaner retired the next four batters, and Billy Wagner tossed a scoreless ninth. The end. Pedro Martinez had reached his milestone, and I was there. 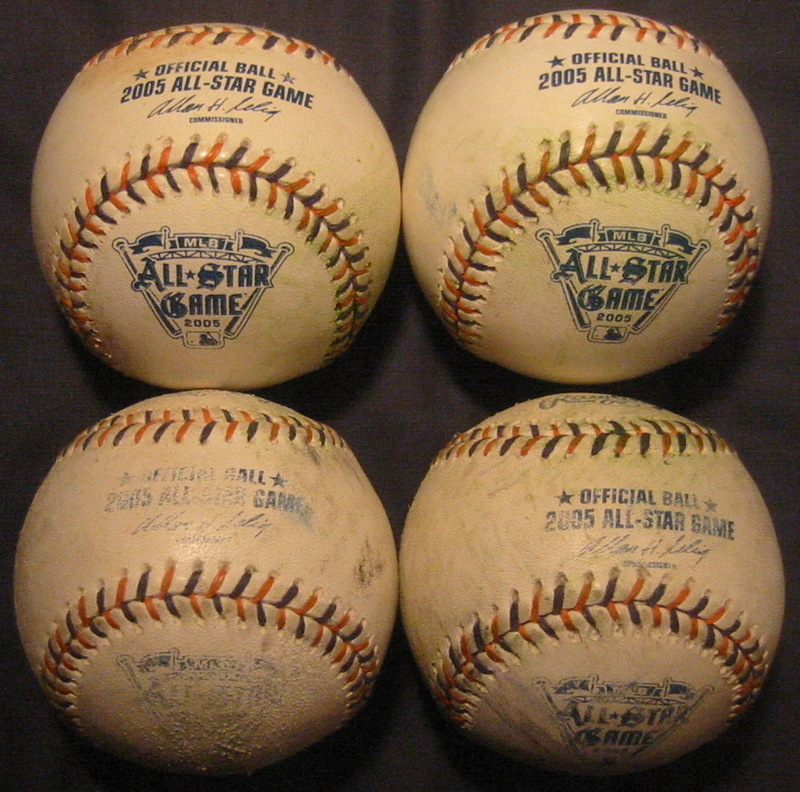 Oh, and by the way, four of my seven balls were of the 2005 All-Star variety, mwahaha. Then, I’ll be meeting Andrew at Shea and doing the whole thing over again. Yesterday, I was filmed for “Mets Weekly.” Today, I’ll be interviewed for “Kids Clubhouse.” Two different shows. I’m not sure when they’ll air, but I’ll find out. What’s up All Star? I am really getting sick of you getting All Star balls, and I get Pacific Coast League balls. Wanna trade? That was the dumbest question I’ve asked anyone in a while. Well, my next snagging is Sunday at Ameriquest. I hope they have BP? Who knows on a Sunday. Congrats on all the coverage! I look forward to seeing your winning smile on TV soon! I’ll have to try and catch that segment when it’s on TV. I don’t watch SNY much. Thanks a lot. Now every 8 year old Met fan in town will be at batting practice. You’re ruining this for the people who have been snagging for years. You ruined the last good thing in New York. i would have taken full advantage of the press pass, and i agree with joneli24, because zach will always ctach baseballs no matter what, hes the pioneer of baseball collecting, and if there were a baseball collecting hall of fame, he would be the first person inducted. well maybe the hall of fame thing is going a bit too far. when r u heading out to PETCO Park zach? i might be able to go since i only liev like 1 hour and a half away. Life’s not fair. I actually wouldn’t mind getting ONE minor league ball, but no, sorry, I ain’t gonna trade…but you knew that already. Good luck on Sunday! Let me know how it goes. Thanks. I enjoyed seeing you on the MLBlogosphere blog. It’s gonna air on Saturday at like 11:30 a.m. ET, or noon, and then keep running on and off throughout the week. Thanks…but CHUCKSTER does have a point. I appreciate your point of view, and it’s actually something I considered long before I even had this blog. I wasn’t so sure I wanted to write a book about getting baseballs because I didn’t want to reveal all my secrets and strategies. But you know what? I’ve found that it really hasn’t changed the amount of competition at Shea or other ballparks. Fans will go to games if their local team is winning, or if the weather is nice, or if there’s a great promotion, or if it’s a holiday weekend. Most people don’t go to games for the sole purpose of getting balls. And even when they do, they’re still usually not there before the gates open. In any case, I *hope* this blog helps some eight-year-olds learn how to get baseballs. I wish I’d been able to read something like this when I was that young. Also, while kids have an advantage by being young and cute, us grownups have an edge by being taller and quicker and more athletic. In the long run, I think this blog will bring a few extra kids to BP, but it shouldn’t change things that much. If you’re THAT concerned, just do what I’ve done for years: root against the Mets. Thanks for your support. I can’t, however, take full credit for pioneering this hobby. There are guys who’ve been doing this even longer (and with more intensity) than I have. I just do things differently and have some nutty tricks up my sleeve. Well handled and on point, ZH. I’d love to be smart enough to be able to upload it. I’ll ask my techie friends…or if anyone reading this knows how, do tell. Welcome back to the States. I doubt you’ll be able to get SNY, unfortunately. ***** **** ****. I wish I knew how to share it. If you’re serous about the video and if you had it on vhs or dvd and you sent it to me, I could rip it and upload it. I hope you can upload the show, it would be cool to see. I agree that this show won’t change anything about us ‘snaggers’ getting our baseballs. Most people don’t have the ‘courage’ to ask players or coaches for balls. It’s so easy, but the guys on the field can seem intimidating. IF they ignore me, who cares? Do they know me? Plus, what other ‘nutjob’ would make a glove device or use a cup (like me) to pick up balls behind barriers and such? So, congrats to Z on the show, I think it’s safe to say it’s great exposure for us snaggers. However, we will all still get out fill of baseballs at games. And, we will be there earlier (earlier than all of you!!!). Thanks for the kind words AND the offer to rip/upload the SNY segments. How would that work? You’d host it somewhere, like on your own site? And then I’d just send people to it? I wonder if I could have the clip on my own site (www.zackhample.com). I’m so dumb when it comes to this stuff. You think it’s an issue of courage? Huh. I never thought of it that way. But hey, I’m glad you agree about the blog/competition factor. Did you get my email, Zack? Thank you. That WOULD be pretty sweet if the players spot you because they’ve seen my trick in NYC. I did get your email, and I’ll write back soon. After a year of watching mlblogs from the outside, I have created my own blog! Zack, I’m a huge Heath Bell fan, and I was wondering does he have a website where I can email him. Also, I’m interested in purchasing his cards, etc. Look forward to hearing from you. Todd. Sorry for the delay. I answered you in an email, which I’m guessing you’ve seen by now.